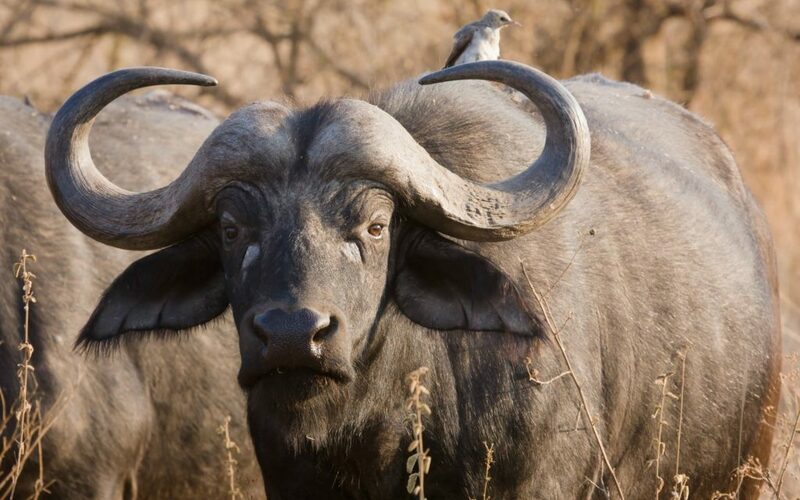 The African buffalo or Cape buffalo (Syncerus caffer) is a large African bovine. It is not closely related to the slightly larger wild water buffalo of Asia and its ancestry remains unclear. Syncerus caffer caffer, the Cape buffalo, is the typical subspecies, and the largest one, found in South and East Africa. S. c. nanus (African forest buffalo) is the smallest subspecies, common in forest areas of Central and West Africa, while S. c. brachyceros is in West Africa and S. c. aequinoctialis is in the savannas of East Africa. 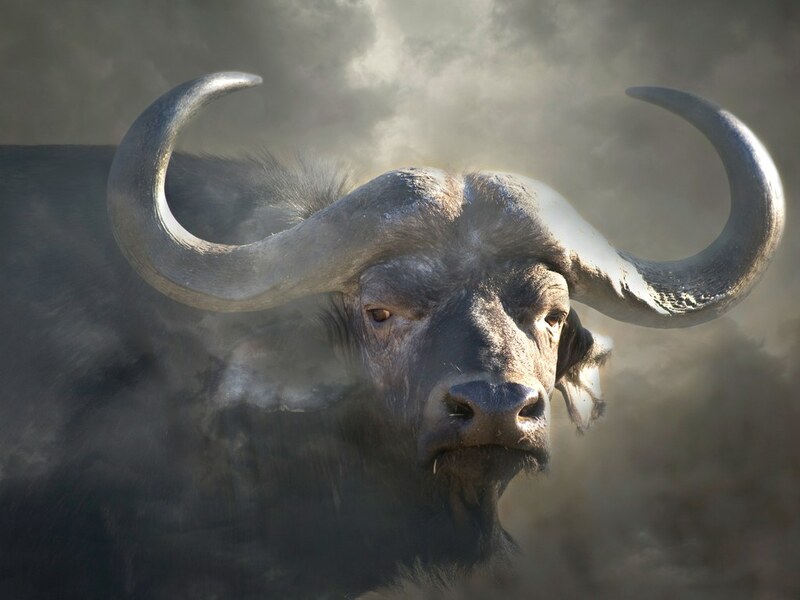 The adult buffalo's horns are its characteristic feature; they have fused bases, forming a continuous bone shield across the top of the head referred to as a "boss". They are widely regarded as very dangerous animals, as they gore and kill over 200 people every year. Savannah-type buffaloes have black or dark brown coats with age. Old bulls have whitish circles around their eyes. Females tend to have more-reddish coats. Forest-type buffaloes are reddish brown in colour with horns that curve back and slightly up. Calves of both types have red coats. A characteristic feature of the horns of adult male African buffalo is fusion of their bases, forming a continuous bone shield referred to as a "boss". From the base, the horns diverge downwards, then smoothly curve upwards and outwards. In large bulls, the distance between the ends of the horns can reach upwards of one metre. The horns form fully when the animal reaches the age of five or six years. In cows, the horns are, on average, 10–20% smaller, and the boss is less prominent. Forest buffalo horns are smaller than those of the savannah buffalo, usually measuring less than 40 centimetres (16 in), and are almost never fused.